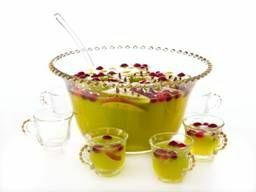 To make a punch Bowl: multiply this recipe by 8. Add the liquids, then add cranberries, pear slices, pierced with cloves, 2 cinnamon sticks and winter melon balls. May also add Champagne, Prosecco or Sparkling water. In a chilled shaker glass, add all the above ingredients. Add ice, shake for 15 seconds, strain into a Collins glass. Garnish with a basil leaf and one raspberry sitting in front of basil in glass. Heat brown sugar and water to a simmer, add spices. When adding vanilla pod, cut down the middle and scrape out the insides into the pot. When this �Toddy Mix� is done, mix 1 � oz of it with 1 � oz of Tullamore Dew Irish Whiskey. Garnish with a lemon peel, possibly flamed or cinnamon stick. Primula, a leader in the hot beverage industry known for their flowering teas has a special limited edition flowering pumpkin shaped and flavored green tea this season. The flowering pumpkin tea makes a great addition to Thanksgiving celebrations, seasonal dinner parties, and any other occasion where someone would enjoy a cup of tea. 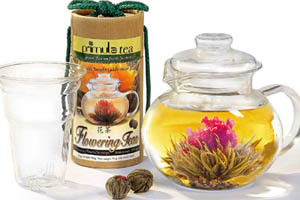 Flowering teas are sure to impress anyone at your table no matter their age. To use simply place a mini pumpkin bulb in a glass kettle filled with hot water. As the tea brews (5-7 minutes) the pumpkin will transform and open to reveal a beautiful orange flower that will go along with any other seasonal decor. The floating flower in the kettle makes for a beautiful centerpiece, offers a seasonal aroma and most importantly a great tasting all natural cup of tea for all to enjoy. Each flower can be stepped 3 times and makes 15 cups (8 grams) of tea. As a special offer now through December 1, 2009 by entering promo-code pumpkin at check out, customers will receive a free package of 6 pumpkin tea flowers, a little treat you can keep for yourself if giving as a hostess gift or as "part favor" to the tea drinker at your Thanksgiving table. Since 1970 the Primula brand has stood for quality hot beverage products. Speak n� Brew is the latest innovation that brings together exciting new features and design, transforming the ordinary into the extraordinary. Primula�s products are consistently ranked among the best in their category. Their most recent product launch Primula Flowering Teas are currently sold at more than 20,000 retail locations. The largest trade and consumer wine event in New England, the Boston Wine Expo offers wine enthusiasts an unparalleled educational and entertaining wine and food experience. The Grand Tasting showcases over 350 international and domestic wineries from 13 countries pouring over 1,800 different wines. Special features include an exclusive Grand Cru Wine Lounge; Reserve level wines will be featured in this separate and sophisticated setting for the most serious wine enthusiast. Industry experts host the 2010 seminar program, offering seminars for all levels of wine-lovers. This year�s all-star lineup includes Marilisa Allegrini, founder, Poggio al Tesoro; Gloria Maroti Frazee, Wine Spectator; Paul Hobbs, owner/winemaker at Paul Hobbs Winery and Vina Cobos; Leonardo LoCascio, President, CEO and Founder of Winebow, Inc; Leslie Sbrocco, award-winning author, Adventures of a Thirsty Gir; Tim Mondavi, Continuum Estate; Christian Tietje of Four Vines Winery; and Gary Vaynerchuk of WineLibraryTV.com. This years keynote speaker Kevin Zraly, noted author and lecturer, leads his highly acclaimed one- hour, fast-paced, action-packed wine seminar. Zraly, often called the "one man Cirque du Soleil" takes you on a tasting tour of Riesling, Sauvignon Blanc, Chardonnay, Pinot Noir, Merlot and Cabernet Sauvignon wines. Ticket Prices: This year�s pricing features newly reduced two-day ticket prices. Ticket Prices: In an effort to bring qualified trade attendees to out exhibitors, special pricing will be available for the trade. As a member of the trade, you are invited to attend a FREE seminar on Sunday at 10:15 am. Please call 1-877-946-3976 for details and trade admission pricing. The holidays are full of traditional festive fun. The reds and greens and evergreen boughs, for the last holiday of the year celebrate in vintage style and ring in the New Year with an old Hollywood themed bash! Colleen Mullaney, entertaining maven and author of It�s 5 o�clock Somewhere, is celebrating the new year with a classic chic flair. Many will be skipping the expensive glitzy parties this year and opting for more intimate gathering amongst family friends. Just because you�re skimping on expensive parties don�t skimp on glam, style and fun for the night�s festivities. Throwing an old Hollywood themed bash is a symbolic and great way to look to the past while bringing in the new. Colleen touts go classic, from cocktails that Ingrid Bergman would enjoy, to nibbles that would have Bing Crosby dancing, throw a bash that celebrates the icons of past Hollywood while welcoming in the New Year and all that the future days will bring. Here�s how to do it. Setting the Scene: Start with the invite, perhaps a black and white photo of Hollywood legends, or a vintage style photo of a champagne glass. Use a silver metallic marker to send a sparkling message about the soiree. D�cor should be easy but stylish, black and white paper lanterns will add great dimension, use accents of silver and crystal, candlesticks and candle light add festive glow through the night. Photocopy vintage photos of stars and place them around the party space for added fun. Fresh or faux flowers of lilies in silver cups make a colorful fresh retro feel. Nibbles can be anything from cheese sprinkled popcorn to spiced nuts. More substantial bites could include bite sized brie in puffed pastry, stuffed mushrooms, and a classic by any standards are Swedish meatballs. Pour vodka into a cocktail shaker. Wash and dry mint leaves, place in shaker and muddle together with the vodka for about three minutes. Squeeze the juice from two lines into the shaker, mix and let the flavors marry for a few minutes. Using a strainer, pour the mixture into ice-filed glasses. 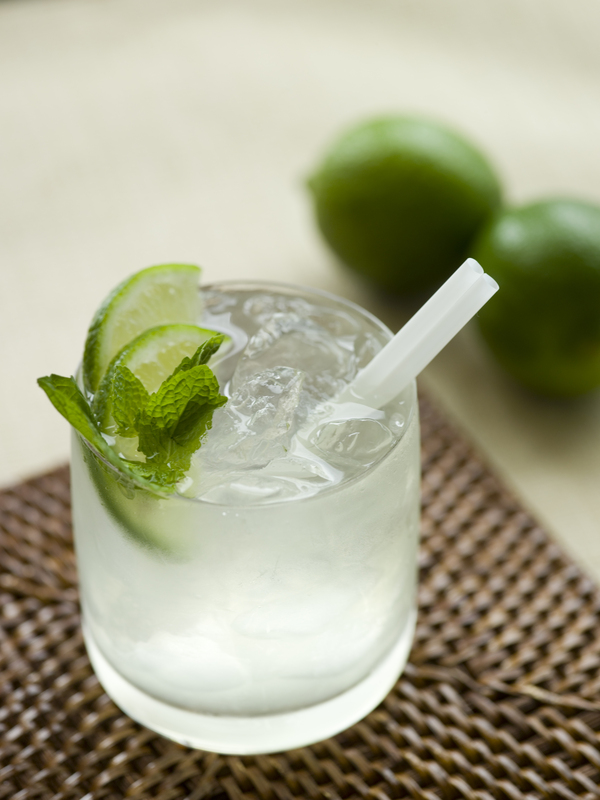 Garnish each with fresh mint and a slice of lime. Serve immediately. The holiday season brings people together to celebrate Christmas, Hanukkah, Kwanzaa and the New Year. In contrast to the chill of winter, these holiday gatherings are filled with warmth, as families and friends enjoy the traditions, foods and libations of the season. As it has for more than 100 years, Korbel Brandy adds an extra measure of warmth to the festivities; in dishes like Christmas pudding, in snifters in front of the fireplace, in punchbowl favorites like mulled wine and in holiday classics like eggnog. The traditional brandy libations are all seasonal favorites, yet brandy also contributes its unique character to some intriguing contemporary drinks. The Hot Brandy Flip may be new to many, but this rich, smooth drink is a fine winter warmer, perfect for small get-togethers. Mix all ingredients, except nutmeg, in a blender and pour into a saucepan. Heat gently on the stove. Pour into warm Irish coffee glasses and sprinkle with nutmeg. Korbel has produced award-winning California brandy since 1889. Unique among United States producers, Korbel maintains complete control of its brandy production process from grape to bottle. Handcrafted in small batches, Korbel Brandy is aged to perfection in premium fire-toasted oak barrels to achieve golden amber color, generous butterscotch aroma and extra smooth taste. Three brandies comprise the Korbel portfolio: rich, flavorful Korbel California Brandy, complex, sumptuous Korbel V.S.O.P. and unique Korbel XS, which blends premium vanilla, natural orange essence, spices and pure cane sugar for one-of-a-kind taste. Get ready and Ring in a �Wild� New Year�s Eve on December 31, 2009 and celebrate the best of Rock N� Roll at Temecula Creek Inn with a tribute to The Doors. The Rock N� Roll experience will be performed by the acclaimed Wild Child Band presented by Hollywood based Golden Crown Productions and Temecula Creek Inn. For the special evening, the resort will transform itself into a colorful party atmosphere with a live concert venue and feature the four-member band who will recreate a live Doors concert on stage in the Yula Ballroom. All tickets will be available at Will Call beginning at 6:00 p.m. at the Yula Patio and the doors open and 6:30 p.m. with festivities continuing throughout the evening until 1:00 a.m.